The Twelve Rhapsodies op. 1 are a mammoth cycle of over 50 minutes (it would have been much longer if Pizarro had taken all the repeats indicated by the composer), something like Voříšek’s Transcendental Studies. Stylistically they fall somewhere between Beethoven, Mendelssohn, with hints of Liszt and Schumann maybe. All these pieces are notated “Allegro”, “Allegro con brio”, “Vivace”, “Allegro furioso”, but all are in A-B-A form, with, usually, a more lyrical and pensive middle section. Their uniformity of architecture may become somewhat wearing after a while, and Voříšek’s middle sections aren’t always as inspired and winning as his more agitated outer ones. Overall the Rhapsodies may not have the profundity of Beethoven or the inventivity of Liszt: they usually sound more superficial than that – there are even whiffs of the Bellini-inspired Chopin (or maybe it is Czerny) in the right-hand runs of the 6th Rhapsody -, but then, composed in 1812-13, they are the work of a 21-year old: Liszt was 2 years old! But what I find even more remarkable is not only how far away they are from the Classical model of Haydn and Mozart, but how removed they also are from any easy-to-pin-down model: they don’t sound like Beethoven, they don’t sound like Schubert (the Beethoven-Schubert reminiscences are much more obvious in the companion Voříšek recital recorded by Artur Pizarro on Collins Classics 14582). The score is available on the International Music Scores Library Project, with more of the composer – I cannot laud enough those who uploaded them – and following the music with it has further enhanced my admiration and helped me become aware of beauties that had escaped my attention on first hearing. The superb 3rd Rhapsody, with its agitated and turbulent triplet runs, sounds like it could have been composed by Schumann, and likewise with the magnificent 4th, playful in an unruly manner. The 7th, with its ferocious broken chords, sounds uncannily Lisztian – Voříšek’s Mephisto-Waltz, as it were. Listening to the enthusiastic and syncopated 8th and trying to find comparisons that could give the reader an idea of what’s in store here, I’d say it is Berlioz’ Benvenutto Cellini at the piano. And the 11th sounds like a Chopin study that would have been written by Beethoven. The titles of Le Désir op. 3 (“Desire”) and Le Plaisir op. 4 (“Pleasure”) – obviously a diptych, although in real life one is rarely followed by the other, as we all know – are unexplained, but (unless similar titles are found in the keyboard music of Rameau or Couperin) they would be the first compositions with a sexual innuendo before Scriabin. Not that it really translates into the music, or it would mean that the emotions linked with desire and pleasure have radically changed since the early 19th century. Following the music with the scores reveals many fine details of writing, but they don’t always translate either in the melodic invention. Le Désir sounds like a lengthy (almost 10 minutes) piece of salon music with not much to catch one’s ear. Le Plaisir is better, and a charming little piece of Haydnesque wits. Pleasure was still very galant in those years, and the exquisite manners of the ancient regime still lingered. Artur Pizarro is a portuguese pianist, born in 1968, who came to attention when he won first prize in 1990 at the Leeds International Piano Competition. He was signed by Collins and made a number of recordings before the label’s demise. He now records mostly on Linn. He must be thanked for tackling such obscure repertoire. In addition, he plays superbly. See my reviews of the competition (Radoslav Kvapil on Supraphon and Olga Tverskaya on Opus 111) to know how superior his interpretations are from the rest who have tackled Voříšek, and how revelatory they are. Informative liner notes, where you get some confirmations of what you hear in the music: that Voříšek was a student of Hummel and Vienna and that Beethoven was his God, that he finally met Beethoven in 1814 and showed him the Rhapsodies still in manuscript and that the great master commented that they were “brav bearbeitet” for such a young man (well worked out), that they were published in 1818 by Anton Diabelli as Voříšek’s opus 1. On first hearing, I might have written that, besides its own appeal, the music of Voříšek, like that of Hummel or Moscheles, makes you understand better the soil from which Beethoven, Schubert, Mendelssohn, Liszt and Schumann emerged and developed. But, after spending a while with Voříšek’s music and learning (thanks to Pizarro) to appreciate its many beauties, I can now turn that sentence around: besides making you understand better the soil from which Beethoven, Schubert, Mendelssohn, Liszt and Schumann emerged and developed, the piano music of Voříšek has much to offer on its own terms. If all the star pianists had an ounce of courage and two ounces of an exploratory mind, they’d impose Voříšek in the concert hall. As it is, we have Pizarro, and on the basis of this and his companion Voříšek disc, he is one of those major pianists. TT 75 minutes. 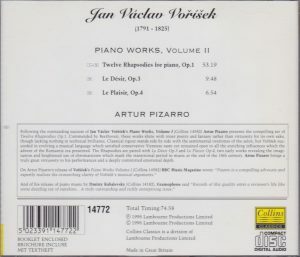 The two volumes of Pizarro’s Voříšek’s traversal were reissued in 2011 as a twofer by Piano Classics, PCLD0009.